New song by Yovanna – Yovanna – “Ela Kori mou ela matia mou” from Celestial Keys. 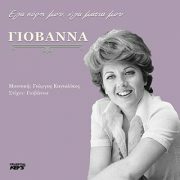 The composer Giorgos Kayalikos is pleasantly surprised by another new song, with the performance of her beloved singer Giovanna, who, after thirty years of absence, returned to the studio to record. With the composer’s simple orchestra, she dresses the lyrics written by Yovanna herself, creating a song – lullaby, her personal story.